Many Oklahoma City Zoo visitors fondly remember Carmichael the Polar Bear, but few realize that his story goes back over 100 years! Carmichael’s history is filled with mystery and inconsistency. Only one thing is clear about the zoo’s polar bears–several different Carmichaels lived at the zoo. Beyond that, records are conflicting. According to newspaper articles, the zoo’s first polar bear was over 40-years-old when he arrived in 1939. Kaiser Wilhelm of Germany, the original owner of the dancing polar bear, sent Carmichael to America for the 1903 St. Louis World’s Fair. He was living at the Cheyenne Mountain Zoo in 1939 when Oklahoma City traded two yaks for Carmichael. During his entire truck-ride from Colorado, the polar bear growled, raged and pawed the floor. He had reputation for being dangerous and difficult. Carmichael’s name was a result of popular culture. His original name was Court of Rome, named after his birthplace. 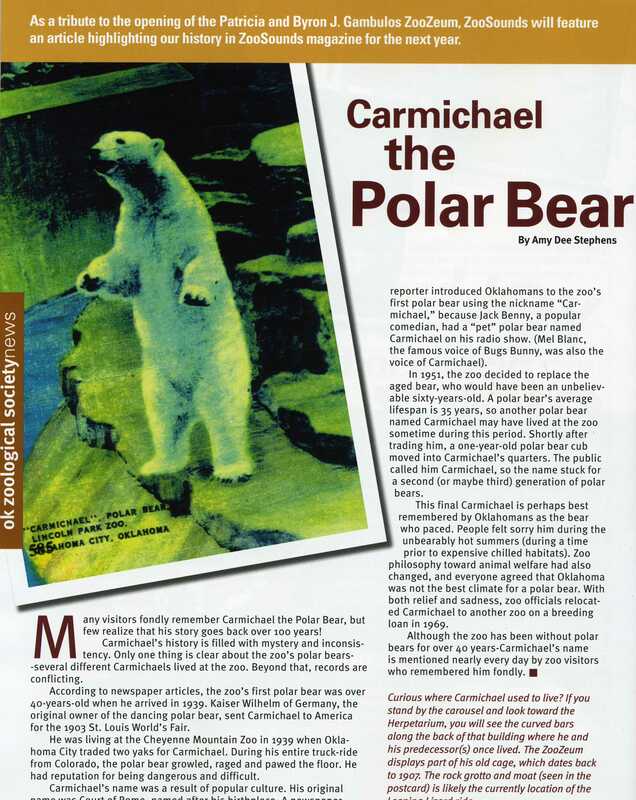 A newspaper reporter introduced Oklahomans to the zoo’s first polar bear using the nickname “Carmichael,” because Jack Benny, a popular comedian, had a “pet” polar bear named Carmichael on his radio show. (Mel Blanc, the famous voice of Bugs Bunny, was also the voice of Carmichael). 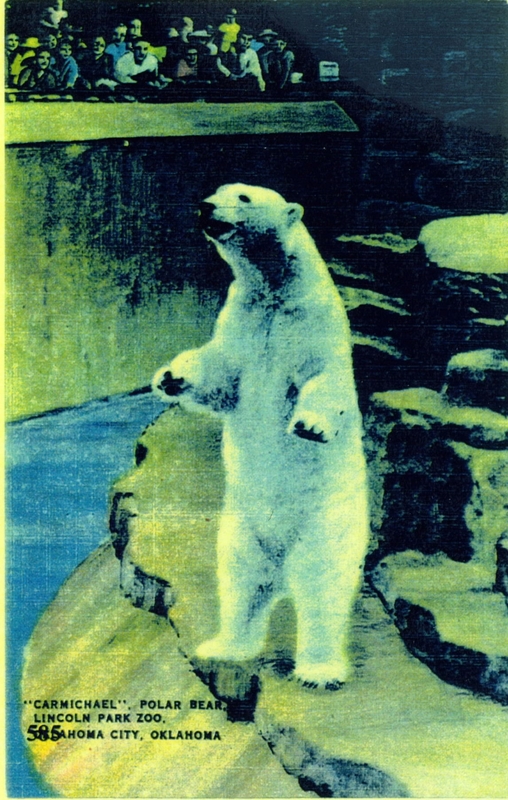 Postcard of Carmichael at the Oklahoma City Zoo. In 1951, the zoo decided to replace the aged bear, who would have been an unbelievable sixty-years-old. A polar bear’s average lifespan is 35 years, so another polar bear named Carmichael may have lived at the zoo sometime during this period. Shortly after trading him, a one-year-old polar bear cub moved into Carmichael’s quarters. The public called him Carmichael, so the name stuck for a second (or maybe third) generation of polar bears. This final Carmichael is perhaps best remembered by Oklahomans as the bear who paced. People felt sorry him during the unbearably hot summers (during a time prior to expensive chilled habitats). Zoo philosophy toward animal welfare had also changed, and everyone agreed that Oklahoma was not the best climate for a polar bear. With both relief and sadness, zoo officials relocated Carmichael to another zoo on a breeding loan in 1969. Although the zoo has been without polar bears for over 40 years—Carmichael’s name is mentioned nearly every day by zoo visitors who remembered him fondly. Curious where Carmichael used to live in the zoo? If you stand by the carousel and look toward the Herpetarium, you will see the curved bars along the back of that building where he and his predecessor(s) once lived. The ZooZeum also displays part of his old cage, which dates back to 1907. The rock grotto and moat (seen in the postcard) is likely the currently location of the Leaping Lizard ride. Gayla Peevey’s Hippo Song…Still Going! So You Want to Write or Illustrate a Children’s Book?